Jordin Caudill, Macro Mimicry, 2014, Repurposed upholstery samples, 9.5” x 9.5”. Caudill’s geometric compositions investigate the design of domestic interior spaces. 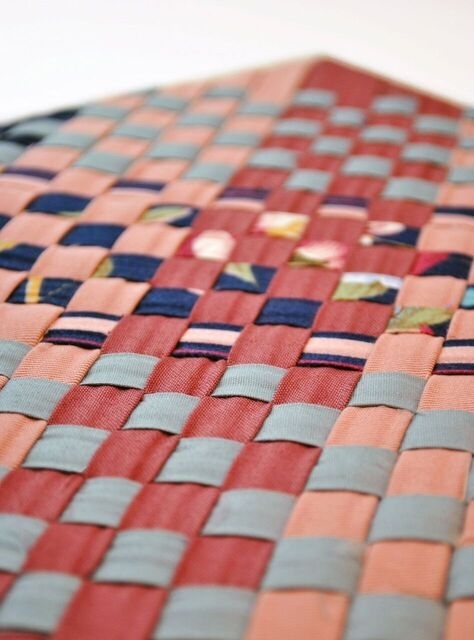 She repurposes household renovation samples, such as flooring, wallpaper, fabric, and laminate, and weaves, sews, and stitches them into two-dimensional pieces. In this body of work, Caudill is inspired by the ornate decorations of 17th and 18th Century Dutch genre paintings. Jordin Caudill is a sculptor and printmaker working in Columbus, Ohio. Since recieiving her BFA from Columbus College of Art & Design in 2014, she has been a finalist for the Greater Columbus Arts Council’s Visual Artist Fellowship award and an intern for both the Columbus Museum of Art and the Ohio Art League.